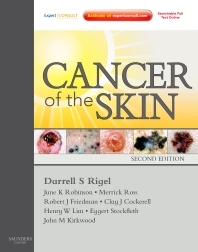 Cancer of the Skin, edited by Drs. Rigel, Robinson, Ross, Friedman, Cockerell, Lim, Stockfleth, and Kirkwood, is your complete, multimedia guide to early diagnosis and effective medical and surgical treatment of melanoma and other skin cancers. Thoroughly updated with 11 new chapters, this broad-based, comprehensive reference provides you with the latest information on clinical genetics and genomics of skin cancer, targeted therapy for melanoma, the Vitamin D debate concerning the risks and benefits of sun exposure, and other timely topics. A new, multi-disciplinary team of contributors and editors comprised of leading experts in this field offers truly diverse perspectives and worldwide best practices. Broaden your understanding of all aspects of skin cancer—from the underlying biology to clinical manifestations of the disease to diagnosis, and medical and surgical treatment—with this easy-to-use, comprehensive, multimedia reference. See conditions as they appear in practice with guidance from detailed full-color images and step-by-step procedural videos. Professor of Clinical Dermatology, Department of Dermatology, Northwestern University, Feinberg School of Medicine, Chicago IL, USA.